1.Preheat oven to 375°F. In medium bowl, combine flour and baking soda. 2.In separate medium bowl, with mixer on medium speed, beat sugars, butter, cocoa and salt 1 minute; scrape bowl with rubber spatula. Increase speed to medium-high and beat 2 to 3 minutes or until creamy, scraping bowl occasionally. 3.Reduce speed to medium. Add water and vanilla extract. Add eggs, 1 at a time, scraping bowl after each addition. Reduce speed to low. Gradually beat in flour mixture, scraping bowl occasionally with rubber spatula. Fold in chocolate chunks. 4.Using 2 small spoons, drop approximately 2 tablespoons cookie dough 2 inches apart onto ungreased baking sheets. Bake cookies 10 to 12 minutes, rotating baking sheets halfway through baking time. Cool 2 minutes on baking sheets on wire rack, then transfer cookies to rack to cool completely. 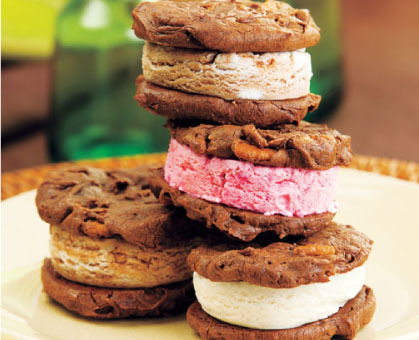 5.Place 1/4 cup ice cream between 2 cookies and press together gently. Wrap sandwiches in plastic wrap and freeze at least 1 hour or up to 3 days.